The Art Of Storytelling: Why Should We Learn It? Storytelling is humanity in words said Jim Blasingame, one of the world’s leading experts on small business and entrepreneurship. And storytelling has been around since the first human beings roamed the earth. In fact, the earliest cave drawings and carvings are proof of their (and our) storytelling capabilities. These first stories helped archaeologists, anthropologists and scientists learn about the earth’s beginnings and early civilizations. Why should we learn how to tell a story? Well, storytelling is a powerful method of communication where the storyteller has an engaging conversation with his/her listeners or audience. The fact is that we all have stories to tell; we were simply born with this ability. However, there is more to storytelling than just plain, passive reading or narration in reported speech. Storytelling is an art that uses several creative techniques including voice, expression and actions to successfully get across the story’s emotions in the most impactful way to the story’s audience. As individuals, we can personally use these storytelling techniques to make a point, to persuade, to inspire, to teach, to reflect upon and to facilitate action. Photo courtesy: lifehacker.com/ Melanie Pinola/ Magenta Rose. Storytelling is a great tool for effective, purposeful communication. When used correctly and in the right situations, storytelling has plenty of benefits to offer for everyone – team leaders, teachers, brand managers, corporate trainers, parents, artists, creative designers, writers et al. Thanks to the explosion of social media, brands today are closer to their target audience like never before. To help their brands stand out from the rest, brand managers need to master business storytelling – promoting brands in a way that engages their audience well, holds their attention and compels them to come back to you for more. Using stories to teach text book lessons promotes learning faster and facilitates better understanding of the concepts. Here is a great example of a science teacher using storytelling to innovate teaching-learning in school. These are people who constantly need to tell their audience (team members or subordinates) how to perform, how to achieve a target and how to succeed. For someone who is always in need of effective ways to demonstrate, explain inspire and persuade, becoming storytellers is the best method by which leaders; managers, coaches and trainers can nurture trust and inspire the desired actions. Parents are not akin to storytelling. However, parents can make this pleasurable activity a learning resource by using stories to teach their kids about different cultures, explain essential life skills like sharing and empathy, help them discover world of science and nature, introduce them to the lives of important personalities and great men and women; the possibilities are limitless. You could be someone who wants to enhance your communication skills or an aspiring author or creative designer or anybody interested in stories and storytelling. You all need a common starting point – a story. Therefore, learning the nuances of storytelling you learn how to effectively voice your thoughts, how to communicate clearly and how to reflect your experiences in your work. Now that you know how storytelling benefits us and understood why you should use storytelling in your work and life, here is a chance to learn the art of storytelling. Story Matters, a two day storytelling workshop for adults is being held on 10-11 May, 2014 at Rangoli Metro Art Centre, MG Road, Bangalore. This one-of-a-kind workshop will tell you everything about storytelling and teach you how to become a master storyteller. 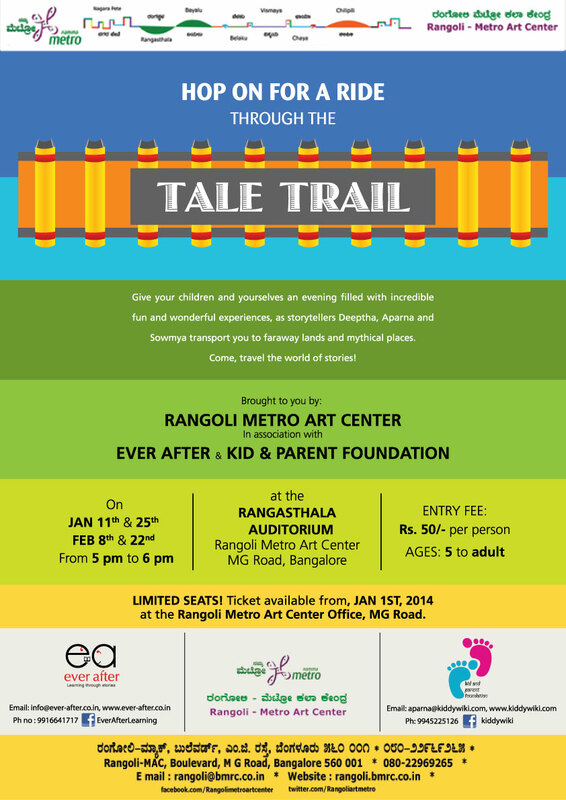 Story Matters will be curated by experienced, professional storytellers, Deeptha Vivekanand of Ever After Learning, Aparna Athreya and Soumya Srinivasan of Kid and Parent Foundation who share among them over 17+ years of storytelling experience and are known for their highly interactive, experiential and delightful storytelling sessions for kids and adults alike. For registrations and more details about the workshop, please go to our Facebook page.